In an exclusive Nation interview, the deposed Honduran president assesses the significance of his recent meeting with Secretary of State Clinton. 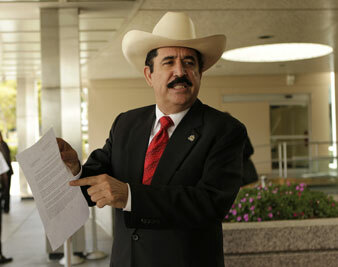 Zelaya points to a State Department document as he speaks to the media following his meeting with Clinton on September 3, 2009. In a significant development in hemispheric relations, the Obama admininstration yesterday condemned the June 28 Honduras coup d’état more strongly than ever, announced the cutoff of additional millions in economic aid and declared it would not accept the legitimacy of elections under the auspices of the coup government. Following the State Department meeting, a US spokesperson announced the termination of “a broad range of assistance” to Honduras as a spur to encourage the return of President Zelaya and democratic processes to the country, which has been under repression for two months. Zelaya told The Nation that the US would terminate multi-year Millennium Challenge grants in the range of $200 million, involving funds for roads, ports and infrastructure. Clinton chairs the Millennium Challenge corporation, which meets next week. With these decisions, the Obama administration has made clear that it embraces the Latin American consensus that the coup was an illegitimate transfer of power. “Mexico, Central and Latin America already had taken a position on the elections. We were only missing the United States. Now in light of these statements, the entire continent is condemning these elections under the de facto regime,” Zelaya said. There will be “a permanent convulsion” and a “permanently ungovernable country” if he cannot return, and “that’s what everybody wants to avoid.” The social movements in Honduras “are not willing to go back to the way things were before,” he noted. What the June 28 coup was able to prevent, for now, was an advisory referendum planned for three days later on whether there should be a constituent assembly to rewrite the Honduras constitution, promoting greater participatory democracy. But the same coup also provoked the rise of a new social movement with its own dedicated members, martyrs and new memories. But the right-wing groups from Latin America to the Beltway have employed a Democrat and ardent Clinton supporter, Lanny Davis, to lobby for their interests in the capital, or what Zelaya calls “the empire of capital.” Democratic consultants also are sprinkled in the coup delegations to the Costa Rican talks. Perhaps no lobbyist is closer to the Clintons than Lanny Davis. When his name was raised critically by Zelaya during the meeting, the secretary of state did not acknowledge that Davis was her longtime family ally but instead took notes on Zelaya’s claim of Davis’s false charges and promised to investigate them. “She didn’t tell me what she would investigate,” he added, with a good-natured chuckle. For Clinton’s State Department, the tone of the meeting marked a shift from frosty previous statements on the coup. After Obama’s initial observation that an undemocratic coup had taken place, State Department spokesman Philip Crowley said that a coup had not taken place, in legal terms, and ridiculed Zelaya for being allied with Venezuelan President Hugo Chávez. “If that is the lesson that President Zelaya has learned from this episode,” he remarked amidst laughter in a July State Department briefing, “that would be a good lesson.” On August 4, a State Department letter to Senator Richard Lugar said Zelaya’s “insistence on taking provocative actions…led to a confrontation that unleashed the events that led to his removal.” The term coup d’état was not used in the letter. Whatever Lanny Davis’s spin may be, yesterday’s developments represent a sharp rejection by the Obama administration of going it alone in Latin America. The State Department’s Crowley was not present at the meeting yesterday, which included longtime Latin American diplomat Tom Shannon, National Security Council representative Dan Restrepo, US ambassador to Honduras Hugo Llorens, and a different public relations spokesman, Ian Kelly. The present tension may be winding down, but it is not over. Micheletti, abandoned by the Americans in his quest to legitimize the coup, is under enormous pressure to accept the recommendation of Costa Rican President Oscar Arias that he step down, which would be a huge victory for Latin America. On the other hand, any return to Honduras by Zelaya could be volatile, with the right-wing wanting his arrest or even his death. He cannot run for re-election under the present constitution. There is no visible candidate to replace him, and the constituent assembly proposal is off the agenda for now (or “por ahora”, as a young Hugo Chávez once said upon release from prison). The future may lie with the social movements that have risen against the military coup, with Zelaya serving as a transitional hero to the mobilized and awakened people on the streets of Honduras who are trying to take an unpredictable future into their own hands.